If you’re an alien planning to invade the Earth, choose today, July 11. Chances are that our planet will offer little or no resistance. On that day, most members of the Earth’s dominant species – the nearly 7 billion humans – will be preoccupied with 22 able-bodied men chasing a little hollow sphere. It’s only a game, really, but what a game: the whole world holds its breath as the ‘titans of kick’ clash in the FIFA World Cup Final. Played across 10 venues in South Africa, this was much more than a sporting tournament. It’s the ultimate celebration of the world’s most popular sport, held once every four years. More popular than the Olympics, it demonstrates the sheer power of sports and media to bring together – momentarily, at least – the usually fragmented and squabbling humanity. Indeed, the exuberant and vuvuzela-blaring spectators flocking to South African stadiums make up only a small part of the global audience following these games. Far more are following it on big or small screens all over the world. When a game is underway, it’s not just the fans of two participating nations who cheer or despair. For 90 scintillating minutes, human divisions like race, skin colour and literacy are blurred and forgotten. At that moment, we are all citizens of Planet Football. On June 24 evening, standing at a street-side pub in the charming little Swiss town of Nyon, on the bank of Lake Geneva, I watched Japan play Denmark. The small crowd around the large flat-screen TV was a miniature global family, and included a solitary Japanese – a colleague from NHK, Japan’s public broadcaster. Evening light was still fading in Europe when Japan won 3-1 to enter the final 16. Seven hours ahead in time, and well past their midnight, the land of the rising sun erupted in jubilation. Distances and time zones didn’t matter. Such scenes were being repeated as various teams advanced or dropped out in the tournament. This sporting event is tipped to be the most-watched television event in history. Hundreds of broadcasters are transmitting the World Cup to a cumulative TV audience that FIFA estimates to reach more than 26 billion people. The operative word here is ‘live’ – kick by kick, goal by goal, as it happens. Arthur C. Clarke, who in 1945 first envisaged the use of geostationary satellites for global broadcasting, once suggested a neat phrase to sum up this remarkable phenomenon: How the World was One. For the past month, the winning formula for unifying the Global Family seemed to be: international football + live broadcasts + live coverage via the web and mobile phones. And it’s by no means a passive family of couch potatoes. Media and telecom companies have launched mobile applications, most of which offer live scores, news updates or interactive features. Some integrated with social media platforms like Facebook or Twitter. 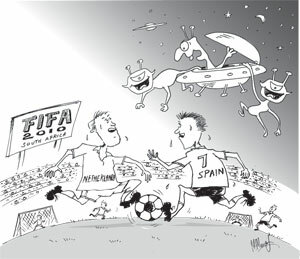 As Associated Press reported when the tournament kicked off: “With games airing live on cell phones and computers, the World Cup will get more online coverage than any major sporting event yet". Online or offline, the result is the same: people from all walks of life are endlessly debating individual games and speculating on the eventual outcomes. How refreshing it is that, for once, we are arguing about a game, and not politics, economics or reigion. If only we could continue to live on Planet Football… These myriad conversations are unfolding to the upbeat tune of the FIFA World Cup Anthem, “Wavin' Flag” (The Celebration Mix). Sung by Somali-Canadian artist K'naan, it might as well be our planetary anthem -- an idea that some social activists and artistes have dreamed about for decades. And what better place to can anchor this phenomenon than South Africa, the Rainbow Nation? They’ve been here before. Fifteen years ago, the country hosted the 1995 Rugby World Cup. Shortly after his election in 1994, President Nelson Mandela realized how his nation was still racially and economically divided in the wake of apartheid. Running up to the championship, he hatched a little plan with the captain of South Africa’s rugby team. The game became more than a game (it always does!). The nation with 11 official languages and many dialects was soon speaking the universal language of sport. This intriguing story is recounted in Clint Eastwood’s remarkable 2009 film Invictus, starring Morgan Freeman as Mandela. It’s also a strong reminder of the power of live television. That’s what an astute Mandela harnessed to bring all South Africans under the new flag of his resurgent nation. He didn’t issue any decrees to the country’s pluralistic media. There were no lofty speeches, slogans or ‘infomercials’ extolling the virtues of national unity. Instead, Mandela reached out to the Rugby team, and let real life images do the talking. Images showing blacks, whites and others across the vast country cheering a (mostly white and initially unpopular) South African team were poignant -- and wholly effective. The football and TV screen both have an addictive effect over our minds. Add live broadcasts to the mix, and that power is suddenly multiplied. The world football federation FIFA, with its 208 member associations, is probably more influential -- and certainly better known -- than the United Nations, with its 192 member states. The difference is in media outreach. It signifies the rise of soft power in our always-connected information society. On second thoughts, those invading aliens don’t need to worry too much about the Earth’s political leaders or their armies. Without firing a single shot, the globalised media have quietly taken over our Global Village (and now it’s too late to resist!). If the ETs want to meet the real sources of global power, they must look for the Emperors of Eyeballs, and wizards of web and mobile. Whoever wins on July 11, these are the ones who will be laughing all the way to their banks. Science writer Nalaka Gunawardene loves to watch people who watch television. Suspicions of him being an alien spy have never been proven.